We continue our new monthly series on “Long-Jet”, short for Longevity. 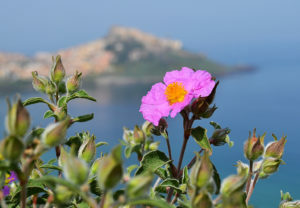 We provide a closeup on the next Blue Zone: the Island of Sardinia as well as a tea from the Mediterranean rockrose plant that grows on the island. One of our primary sources for this monthly series is National Geographic’s “Blue Zones … The Science of Living Longer”, October/November of 2018 edition. For each “Blue Zone” we highlight this year, we will emphasize their sources of potable water … in our opinion, active electromagnetically-charged water such as clean rainwater, is one of the top secrets to good health. The longevity of the Sardinians is baffling doctors. On average, Sardinians both smoke tobacco and drink alcohol more than mainland Italians. The senior population on Sardinia have the same or greater risk factors with similar incidences of poor or weak kidney and heart functions. What is different is senior Sardinians generally maintain good micro blood circulation over their long life. Sardinian Diet: The cuisine is typically animal based (including sheep’s milk, goat cheese and lard) while meals made by mainland Italians is typically fish based. Backyard vegetable gardens are common. One theory is the island soil was not converted to intense crop agriculture (less herbicides and pesticides exposure). Shepherds tended to both sheep and goats that grazed on grasses surviving on rocky slopes. The diet is typically high in carbohydrates such as bread, potatoes and beans. Additionally, olive oil is used in many dishes. Primary Potable Water Source: Spring water and rain water cascading down the rocky slopes are collected in reservoirs. Rainfall events are irregular that make potable water on Sardinia scarce at certain times of the year. Perhaps the doctors who are researching why Sardinians live longer due to sustained micro circulation should consider the plant life growing in the hills. According to Dr. Dietrich Klinghart MD, human defense against invading viruses (called endogenous retro-viruses or HERV) are less virulent due to environmental toxins, resulting in higher incidents of neurological diseases. Adverse fungi, mold and bacteria invasions of the human body with lower immunity defense, also can reduce blood circulation. His treatment protocol of Lyme’s Disease is to take skullcap, broccoli sprout extract and/or drink tea (or tincture oil) made from the Mediterranean rockrose, Cistus incanus, that grows on the rocky hillsides of Sardinia. The Sardinian shepherds had traditionally known the healing effect within their flocks when they passed near the rockrose plants. During the WWII German invasion of Italy, the German troops stole the available olive oil supplies. The Cistus oil was substituted to help in the healing of wounds. According to Dr. Klinghart, he recommends that the Cistus tea be re-steeped for two or three servings to obtain the complete anti-oxidant value. Photo credit of Cistus incanus is from a Google photo search.